Taken at Otmoor, Oxon., on September 11th 2016. Ab. bialbata. Taken at Otmoor, Oxon., on September 11th 2016. Underside. Taken at Abingdon, Oxon., on September 26th 2017. 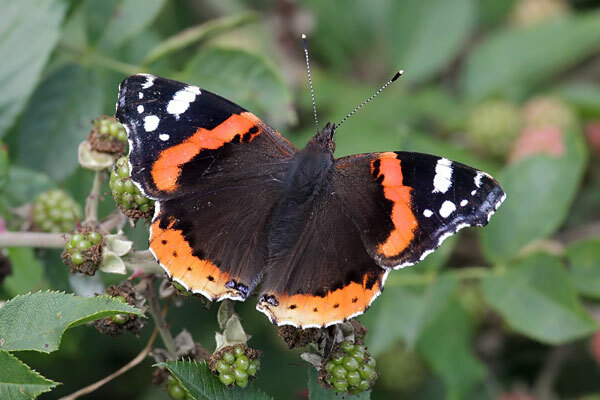 The Red Admiral is primarily a migrant to the British Isles, but some individuals are able to spend the winter here. It can thus be seen at any time of year. It can be found throughout the British Isles, even reaching Shetland in some years. 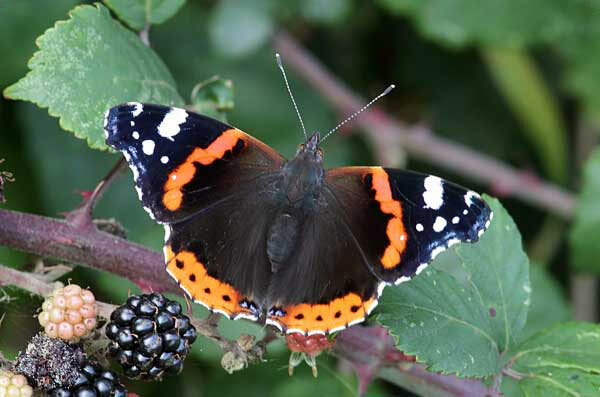 Red Admirals can be seen in any type of habitat, including gardens and orchards. There is a gradual build-up of adults from May onwards. These mate on arrival and give rise to the next generation of adults, which culminate in a peak in the autumn. As the temperature falls, fresh adults change behaviour and start flying south without mating. Large numbers may accumulate on the southern coasts of England and Ireland prior to flying across the Channel. When they arrive in the Mediterranean region, nettle beds have recovered from the dry summer and have fresh, lush leaves that are ideal for breeding. The resulting caterpillars grow slowly during the winter, before pupating and emerging in March or April. The adults immediately begin a northwards migration. The main larval foodplant is Common Nettle. Hop, Pellitory and Small Nettle are also used. Adults love to feed on over-ripe fruit. They also feed on flowers such as Buddleia, Michaelmas Daisies, Sedum and Ivy. 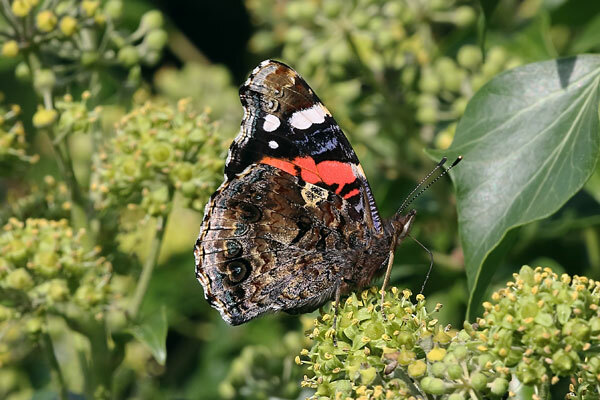 Red Admirals spend much of their lives on the move, with periods of cross-country travel interspersed with periods of feeding, basking and egg-laying.